Every year, during the month of June, LGBTI communities around the world celebrate Pride month to honor the contributions, past and present, of lesbian, gay, bisexual, transgender and intersex people and the ongoing fight against all forms of discrimination. June was chosen for the celebration of Pride month because it is when the landmark Stonewall Riots (also known as Stonewall uprising) took place, on June 28, 1969. On that day, a series of confrontations were triggered when gay rights activists stood up to police harassment outside the Stonewall Inn, a New York gay bar. Out of this an international gay rights movement was born as Stonewall became a symbol of resistance to pervasive social and political discrimination and inspired a movement of solidarity which continues to resonate. 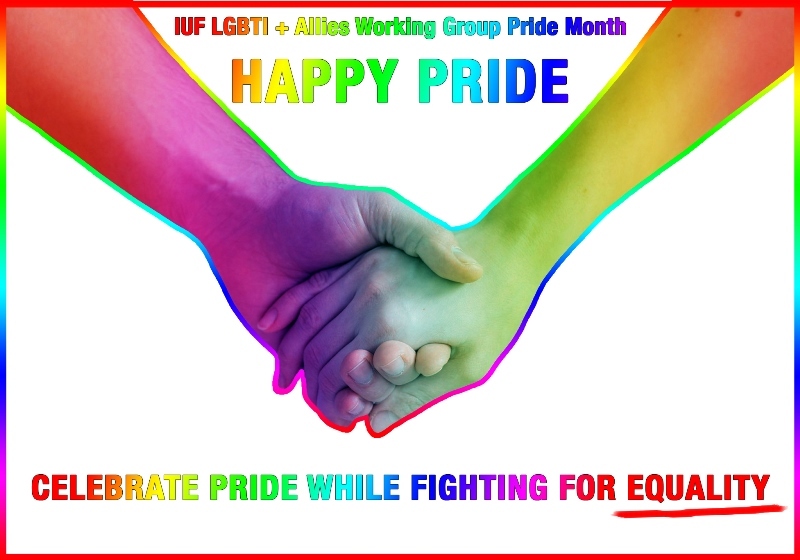 This year, IUF affiliates celebrated Pride month with a variety of activities promoting rights, diversity and inclusive workplaces for LGBTI members and all workers. UFCW OUTreach in the US has created a Pride Guide and a pamphlet to help its members with LGBTI issues in the workplace. Unite the Union in the UK is participating in regional community-based Pride events and is increasing its support for UK Black Pride. See Unite the Union Statement on London Pride here. US affiliates UNITE HERE and RWDSU are promoting their Pride Month messages through graphic designs. In line with the Pride month's objectives, the IUF LGBTI and Allies working group will continue to add its voice, collective power and resources to the movement for full LGBTI equality for all workers and their families.